Edinburgh University prove too much as they dominate City of Edinburgh Kool Kats in final game of Playoff weekend to claim the 2018 Playoff Champions title, 75-51. The final game of the weekend saw an all Edinburgh clash again as Edinburgh University took on City of Edinburgh Kool Kats who were appearing in their 5th final of the weekend. We had a chance to catch up with both teams ahead of the game for their views of the task in hand. “it’s a great opportunity for the team to show how far we’ve come throughout the season”. Today will be an interesting day for Pollyanna Storie who competed for Kats yesterday in the u18 Women’s Final but has made the switch to the Uni side as she represents Caledonia Pride at WBBL. She’ll be looking to make an impact on her club. Kool Kats started the game running plenty of backdoor cuts against the high EU defence, mustering a 1 point lead 7-6 when Henderson checked in and made an immediate impact with her high intensity defence and rebounding. EUBC coach Jordan Webb noticed Kats’ lack of height and brought on Storie to join Kai-Brith Kalda, 2 tall players posing as a towering duo to out rebound the Kool Kats. Edinburgh Uni were asking questions on the Kool Kats’ defence the whole quarter and not allowing them to run their offence behind the high work rate of Alix Henderson. Edinburgh Uni held on to lead CoE Kool Kats 18-13 at the end of the 1st quarter. Edinburgh Uni kept the aggressive defence up through the start of the 2nd quarter, with Kats’ having to play their very best basketball to score. Play their very best basketball they did as Kat’s cut EU’s lead to just 1, not for Henderson to keep her high motor going and get fouled while scoring a put back layup. Kats were trailing and in some foul trouble as EU continued to be a problem driving to the basket. Webb had his girls playing full court defence and move the ball on offence which got Pride player Hansine Marshall for an open look from the corner to open up their lead 34-23. Some outstanding defensive and offensive rebound allowed EU to race down the floor again at the hands of Pollyanna Storie, only for Marshall to hit another 3. Edinburgh University closed out 2nd quarter only allowing one basket in the final minutes as they led 39-25 at halftime over City of Edinburgh Kool Kats. Shawnisay Millar was imposing herself physically all over the game, no one able to out-work her as she barrelled her way to the basket, defenders literally falling off her. Her and her team mates continued to barrage the key with bodies resulting in the scoreboard ticking over to a 22 point lead. Through 5 minutes of second half action, Kool Kats only managed to put together a single basket whilst EU had gone on a 12 point run. The troubles continued for Kats, going on a 2 v 1 fastbreak, Alex Nelson still managed to turn it over, nothing going Kool Kats’ way. EU continued their suffocating defence on the Kats throughout the 3rd quarter allowing only 10 points while putting up 21 themselves as they commanded a 60-35 lead at the end of the 3rd quarter over the Kool Kats. The intensity was still on show for EU but the defence starting to seep more baskets in as Kats put in 6 unanswered points. The substitution of Marshall entering the game proved to be a defensive move and she and fellow sub Henderson, both brought the defence back. Kai-Brith became a bigger part of the EU offence as she scored 6 consecutive points herself, finishing close to the basket to keep the Kats at bay. S. Millar and Phillips played as a dynamic duo bouncing off each other well on the court finding one another on cuts and drives for easy baskets, Millar smashing her way to the rim like a speed demon pushed the score 73-48. Kats began to have more fluidity to their game, Emma Findlay trying her hardest to get the score board to tick over, but it was of no avail as EU proved too much. 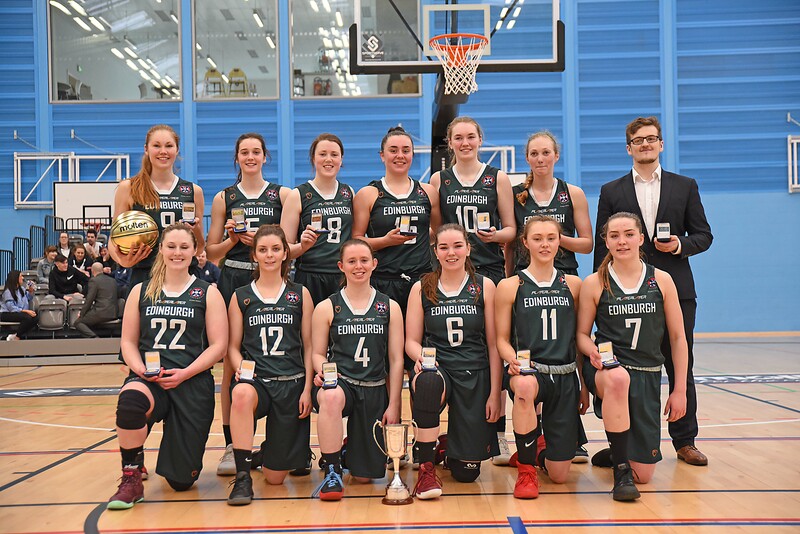 The University of Edinburgh were crowned 2018 Senior Women’s Playoff Champions as they defeated the City of Edinburgh Kool Kats 75-51. Kai-Brith Kalda was named the Molten Sports MVP.